Although times have changed, records are still a very valued piece of technology. Even despite that there are different and even more convenient ways to listen to music, records still have a following of their own. 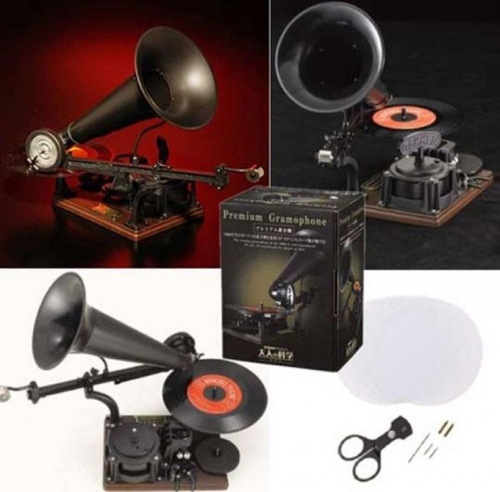 If you would like the opportunity to record your own music onto a record, now you can pick up the Gakken Premium Gramophone. In order to use it, just sing directly into the horn of the gramophone. As you go a bamboo needle will cut grooves into your brand new vinyl record. For those of you that want a little more than the exact sounds coming out of your mouth to printed onto the record, you can also adjust the tone and the speed. When you purchase the kit it’ll include the bamboo needle and gramophone body, plus a recording sheet and a bamboo needle cutter. You can purchase it for $144 through the Japan Trend Shop.